Buenos Aires is a beautiful city, it’s true. Some parts are nicer than others – I would rather stroll through Palermo than Once – but there is still almost always a piece of architecture or a series of street spanning trees that makes you pause and probably trip over a piece of broken sidewalk. Unfortunately, no matter where you are in the city, the beauty usually has to be seen in spurts, after the haze of exhaust from the last colectivo settles and before the next lurches into site. Buenos Aires has a serious pollution problem, as anyone who has lived here more than a day or two can tell you. According to one website, while only 3.1 million people live in the Capital Federal, there are around 12 million people – commuters, students, tourists – here every day. 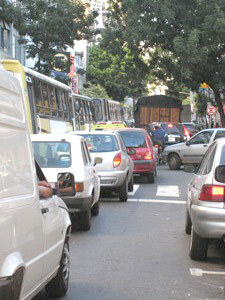 This means that transportation is always a mess, especially at rush hour, when cars sit idling on Avenida 9 de Julio. Smog gets in our lungs and our clothes and, for an asthmatic like myself, the difference in air quality is palpable when I go out for a morning jog. Beyond affecting the health of people living in the city, pollution also corrodes paint, decreases visibility, and creates unpleasant smells. And this is only air pollution. What about noise pollution and light pollution? All of these forms of pollution are major reasons, besides the heat and the humidity, that citizens of Buenos Aires will be doing everything they can to get out of the city for the summer months of January and February. But we, the tourists, will still be here, and as some of the “extra” people helping that baseline of 3.1 million rise to 12, we too should think about what we can do to reduce pollution. For those here only a short time, the best advice I can give you as a traveler and an eco-conscious citizen – don’t rent a car! Believe me, you don’t want to drive in Buenos Aires and the last thing this city needs is another driver who doesn’t understand the mysterious rules of the Argentine road. The Buenos Aires public transportation system is excellent and even if you don’t speak any Spanish the subways can usually get you close enough to walk to where you want to go. If you want to test your Spanish and your wings, try using a colectivo. 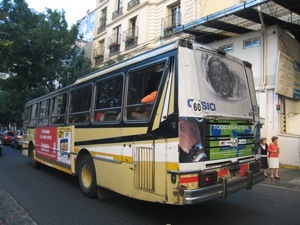 These city buses are not for the faint of heart but they will bring you literally face to face with Argentines from every walk of life. If you end up on the wrong side of town, there is always a taxi that can get you back home. As a long term resident, there are a few more things I do to combat pollution. I only use my air conditioner at night, I ride the subway instead of a bus when I can, and ideally I walk, enjoying the scenery and a lung full of carbon emissions. These are only small life style changes – they make hardly any different at all. But at least they are a start and a small sign of respect for this wonderful city. So true! I have lived in BA for over a decade and can attest to the fact that it is highly polluted. The worst offenders are the buses. The problem could be solved quite easily if there were the WILL to do it. There isn’t. I was in London earlier this month; New York yesterday. NO bus pollution there! The buses are also many times quieter in those cities. This page rendered in 0.281 seconds.